How can TheraTogs contribute to the management of children with flexible kyphosis and/or lordosis? TheraTogs undergarments and strapping systems are designed to sustain gains in functioning joint alignment that are made either actively or with unforced manual facilitation. The undergarments provide a gentle, mechanical assist and attachment sites for strapping that shortens the long muscles and allows them to work in shortened state. TheraTogs can be used to manage mild, flexible, correctable scoliosis with routine orthopedic monitoring. 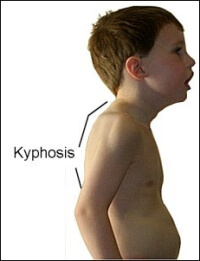 Flexible kyphosis and lordosis are common postural alignment problems that can occur in the presence of ligament laxity or strength deficit, with or without neurologic deficits such as hypotonia, cerebral palsy, ataxic CP, ADHD, ASD, Down Syndrome, and developmental delay. Kyphosis describes a rounded spine – convex on the back side. Ligament laxity might be a contributing factor. The head is carried forward. The upper (thoracic) spine is usually involved in kyphosis. In kyphosis, the muscles beside the spine and connecting the shoulder blades to the spine are long. The upper neck extensor muscles, the muscles in front of the shoulders, and muscles connecting the sternum to the pelvis are short. Lordosis describes an excessively deep, inward curve in the spine, concave on the back side. The lower (lumbar) spine is usually involved and the pelvis tilts forward excessively. 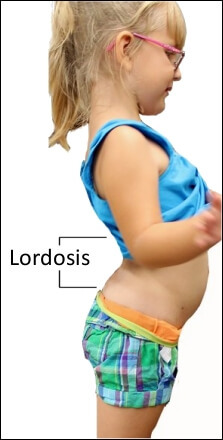 In lordosis, the abdominal and hip extensor muscles are long, and the muscles on the back of the lumbar spine, and in many cases, the hip flexor muscles, are short. In some cases, the thoracic is lordotic (too flat – not rounded enough) and the lumbar spine is kyphotic (too flat – not curved enough). Sahrmann SA. 2002 Diagnosis and Treatment of Movement Impairment Syndromes. St. Louis, MO: Mosby. Sahrmann SA. Movement System Impairment Syndromes of the Extremities, Cervical and Thoracic Spines. St. Louis, MO: Elsevier Mosby, 2010.